Sydney is known for nightlife, trails, beaches, parks, and museums. 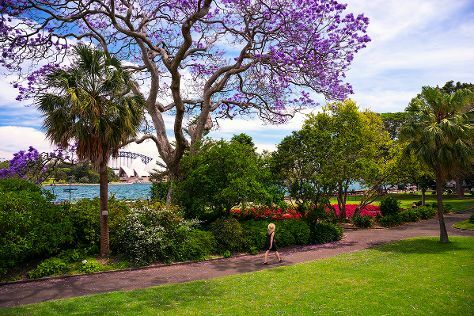 Your plan includes some of its best attractions: take in nature's colorful creations at Royal Botanic Garden Sydney, make a trip to Sydney Opera House, enjoy the sand and surf at Manly Beach, and stroll through Bondi Beach. Kuching, Malaysia to Sydney is an approximately 11-hour flight. You can also do a combination of bus and flight. The time zone difference when traveling from Kuching to Sydney is 2 hours. Expect slightly colder temperatures when traveling from Kuching in April; daily highs in Sydney reach 26°C and lows reach 17°C. Wrap up your sightseeing on the 16th (Tue) early enough to travel to Melbourne. Melbourne is known for museums, shopping, parks, nightlife, and zoos & aquariums. Your plan includes some of its best attractions: admire the natural beauty at Royal Botanic Gardens, get interesting insight from Tours, browse the collection at State Library of Victoria, and admire the landmark architecture of Royal Exhibition Building. Fly from Sydney to Melbourne in 3.5 hours. Alternatively, you can do a combination of flight and shuttle; or drive. Traveling from Sydney in April, things will get little chillier in Melbourne: highs are around 23°C and lows about 11°C. Wrap up your sightseeing by early afternoon on the 20th (Sat) to allow enough time to travel back home.